The USA has for a long time promoted itself as a mediator in the Palestine conflict and has tried many times to impose a peace process on the region. Yet despite this the US has repeatedly exposed its bias by again and again blocking any criticism or measures against Israel at the UN. Palestinian woman holds up the key to her demolished house. This support of Israeli policies has allowed Israel to continue to defy with impunity long standing UN resolutions that demand among other things, that Israel withdraw from occupied Palestinian territories, stop the construction of illegal Israeli settlements on subjugated Palestinian land and permit the return of Palestinian refugees. The US has continued this pattern of promoting peace talks, but repeatedly supporting Israel and shielding it from justified censure in the United Nations and other international forums. One such instance was on February 18, 2011, when the US government vetoed a Security Council resolution condemning all Israeli settlements established since 1967 in the Palestinian territories as illegal. The resolution was co-sponsored by over 120 of the UN’S 192 member states and the other 14 members of the Security Council. The UN resolution would have again condemned illegal Israeli settlements and demanded an immediate halt to all settlement building; the US action angered Arab countries and Palestinian supporters around the world. The 14 other Security Council members voted in favour of the resolution in the vote, reflecting the wide support for the Palestinian-backed draft which had over 100 co-sponsors. The veto represented the US government’s first for a Security Council resolution under the administration of President Barak Obama. The Palestinians insisted they would not resume peace talks until Israel halted its settlement building in the West Bank and East Jerusalem, which they want recognised as a capital. Israeli-Palestinian peace talks collapsed just weeks after they restarted in September that year because Israel ended a 10-month moratorium on settlement construction. Right from the start the creation of the state of Israel was a key project of the USA. In November 1947, the US used extraordinary diplomatic, political and economic pressure on various countries to support a policy of partitioning Palestine into Jewish and Arab states. The US exerted the most intense force on Haiti, Liberia, the Philippines, China, Ethiopia, Greece and France among others to get them to vote for partition. The United Nations voted on November 29 that year and the partition plan was approved by 33 votes to 13, with 10 abstentions. The United States was the leading promoter of partition and exerted the full weight of its influence, so that the resolution was passed. The practical effect of the US policy on Palestine, with the UN’s wealthiest and most powerful member state putting extraordinary pressure on other countries was to have the Palestinians lose over 60 percent of their country in terms of area, including their only port, Haifa, as well as Bethlehem and Jerusalem. Following the partition resolution Arab protests and rebellion broke out in Palestine. The Palestinian population were left to face the harsh power of a strong, well-armed military and paramilitary force of the Zionist state. Due in large part to American policies, the Palestinian Arabs were about to begin their ordeal of dispossession, displacement and for many exile. For Israel, US military and political assistance is a crucial Israeli lifeline. The reality is that the USA remains Israel’s staunchest ally and the support that Israel receives from the US is not just political and diplomatic, but the US also provides extensive military and economic assistance. In fact, the USA contributes massive economic and military aid, an estimated $5 billion** annually to Israel in various diverse forms. Israel’s reliance on US assistance have grown steadily since the 1974 Yom Kippur war, which exhausted Israel’s military stockpiles and left the country under a huge burden of debt. In the three years following the war, the United States poured around $4.6 billion in military aid into the Israeli Defence Forces, more than triple the total for the previous 25 years of Israel’s existence. Economic aid from the US grew at an equivalent rate. This increased again in 1979, as part of the Camp David peace accords between Israel and Egypt. During this period, the bulk of Israel’s military aid was provided in the form of long-term loans guaranteed by the US government. Most US loan recipients must repay those debts within 10 years. Israel was given 30 years. In 1987, 20 years after Israel took over the Palestinian territories in the 1967 Six-Day War, massive protests erupted across the occupied territories. In the then Israeli-occupied Gaza Strip, the first demonstrations of the Palestinian uprising (the Intifada or “shaking off” in Arabic*) began one day after an Israeli military vehicle crashed into a truck carrying Palestinian workers in the Jabalia refugee camp in Gaza, killing four and wounding ten. Palestinians were enraged by the incident and on December 9 they took to the streets in protest, burning tyres, throwing rocks and Molotov cocktails at Israeli police and troops. In Jabalia, an Israeli army patrol car fired on Palestinian demonstrators throwing stones, killing a 17-year-old and wounding 16 others. Half a million Palestinians took to the streets to demand an end to the Israeli occupation. And 80,000 Israeli soldiers were sent into Gaza against the uprising. The next day, crack Israeli paratroopers armed with US weapons shot and killed Palestinian protesters. Instead of quelling the protests the rebellion spread to the Israeli-occupied West Bank. 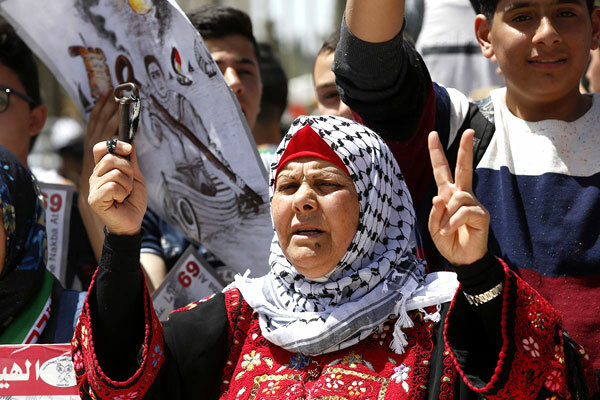 As Israel tried to crush the emerging Palestinian uprising in the West Bank and Gaza, the US Congress also moved quickly and overwhelmingly approved a $3 billion package of military and economic aid for Israel. The aid measures, which included several major items sought by the Israel lobby, were swiftly approved as part of a huge spending bill. On December 22, 1987, the US Congress passed provisions that expanded US aid to Israel by agreeing to refinance Israel’s $9 billion debt to reduce its interest rates. The measure saved Israel as much as $2 billion in interest payments. In addition, Israel was granted its traditional $3 billion in economic and military funds, allowed to use $150 million of its military aid on an advanced aircraft research and development program in the United States and to use another $400 million of its military funding for defence procurement in Israel. Israel also received an additional $5 million for US-Israel cooperative aid and $25 million for refugee resettlement. Direct military and economic foreign aid to Israel is over $3 billion a year. In addition the US provides Israel with about another $3 billion in indirect military and economic funding. Israel receives about one third, over 30 percent of the US foreign aid budget. In recent years the amount of economic assistance has decreased and military aid increased. Each year the total level of such funding increases though; in 2010 US direct aid rose by $225 million. And Israel was permitted to spend up to 25 percent of the over $3 billion for military purchases from Israeli manufacturers with the remaining 75 percent to be spent on military hardware made in the US, an innovative way the US helps its own arms trade industry. It is this huge supply of US armaments, technology and finance which plays a vital role in giving Israel the capacity to maintain the occupation of the Palestinian territories, continue to build and expand Israeli settlements on Palestinian land and repress the Palestinian people’s struggle. This also gives Israel the ability to launch military attacks against the Palestinian Resistance in the Palestinian territories, and in Lebanon. Almost half the official aid to Israel consists of special grants or instantaneously forgiven loans. Military transactions constitute two thirds of this assistance. The economic lifeline between the US and Israel is indispensable in providing at no cash cost the weapons Israel could not buy elsewhere. When it comes to debt servicing these military “sales”, Israel can service this debt only in the formal sense that these instalments are paid when due. But in reality, these instalments are funded through new US aid supplied each year. Israel also receives funds through the US Defence Budget, for instance, it was provided with over $I billion in grants since 1986 for joint military projects like the Arrow Missile project. The US also gave further funds for other projects in Israel, including $53 million for the Boost Phase Intercept program and $139 million for the Tactical High Energy Laser program. In addition, special consideration is given to Israel in other areas. Discount and dispensation aid is another tier of economic assistance. Some weapons transferred to Israel are deliberately under-invoiced at special discount prices. There is also extensive support for Israeli universities and research institutions funded by the US Department of Education and other US agencies, which total almost $100 million per year. The US also provides export concessions, as Israel is designated as a “developing country” by the US, despite its high per capita income, which accords Israel reduced or non-existent tariffs on exports to the USA. Consequently, 96 percent of Israel’s $1 billion exports to the USA enter free of tariffs. In May 2017, US President Donald Trump added to the already generous funding granted to Israel by the former Obama administration. The US government promised to maintain Israel’s qualitative advantage in the Middle East and Israeli Premier Netanyahu revealed, just before Donald Trump’s visit, that “the US added another $75 million to the aid package for Israel’s missile defence program.” So, while the Trump administration carried out budget and foreign aid cuts, Israel as usual was exempt from these. The relationship between the USA and Israel serves the joint national interests of both countries. The US needs a western military outpost in the strategic region. Israel serves the US interests by providing an ally to help the US maintain control of the region and to guard the oil resources and supply lines of the Middle East. The US provides the military and economic backing Israel needs to remain a dominant regional military and economic force, to maintain its rule over the territory it has occupied and to intervene in the surrounding region when necessary to defend its interests and that of its powerful partner. Israel is the largest recipient of US foreign aid in US history. And US aid approximates almost one half of Israel’s national income. The huge extent of the military and economic support given to Israel makes the state very dependent on the US. The amount of aid to Israel was relatively small in 1949, but in the late 1960s this was increased considerably, climbing to $2.6 billion in 1974 and growing each year since. From 1949 to 2007, Israel received more than $156 billion in US aid. This support has made Israel one of the top five arms exporters in the world and the Israeli army the fourth most powerful in the world. This massive military and economic assistance provided by the USA funds the ongoing illegal occupation of Palestine, the increasing expansion of Israeli settlements and the gross human rights violations against the Palestinian people. If there was ever a case of foreign aid sustaining occupation and oppression and funding invasions and mass killings, then this is it. Israel’s colonial, illegal settlement projects in the occupied territories could not be built without this essential US backing. So, despite the US asserting that it wants to mediate to help resolve the Palestine conflict, its enormous sponsorship of Israel clearly exposes its deceit and utter hypocrisy on this issue. Consequently, it is in fact the USA that is the real obstacle to ending the occupation and achieving peace and a just solution. * In the six years of the Palestinian uprising, known as the First Intifada between 1987 and 1993 over 1,300 Palestinians were killed, 120,000 wounded and 600,000 jailed. ** All amounts US dollars.